Eaglemoss have been in the business of manufacturing collectibles for a number of years and publishes between two and five collections a year. Previous collections have included The Lord of The Rings, DC superheroes and villains and a similar collection for Marvel characters although this is just a taster of their extensive output which also includes Star Trek ships and James Bond cars. 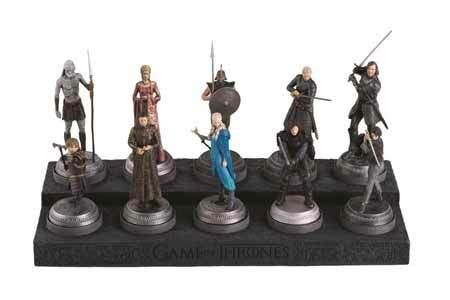 With the beginning of season six of Game of Thrones, Eaglemoss have started to produce a series of character figurines. The scale of the models seems to follow previous collections; with its base, the figure stands a touch over nine centimetres giving a scale of 1:21. 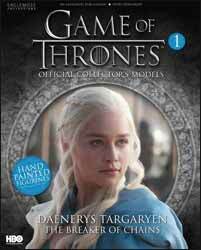 The first figure in the collection is Daenerys Targaryen, sporting the blue dress she wore in And Now His Watch Is Ended. For your cash you get the figurine as well as an eleven paged booklet which is strong on pictures if a little lacking in text. The booklet tells you something about the character as well as letting you know where and when the character appeared in their current threads. The figurine is hand painted, which means that there will be some variation in the finish. I have collected a lot of Eaglemoss’s Sci-fi and fantasy output and initially was very impressed with the overall finish, but something happened during their Doctor Who run which was a little disappointing, the quality of the painting started to slip. Looking closely at the figurine you can see where the painter has not been as skilled as I would like. The silver from the base has spilled over onto Daenerys right foot Also you can see where an awkward angle has led the painter to paint the cream of the inside of the robe onto an area representing the outer robe. On the plus side the modelling is up to Eaglemoss’s high standards. The hands are proportionate and do not look lumpy, the face is done well and bares a passing resemblance to the character. To be fair to the sculptor this is the nearest you’re going to get on a seven millimetre face. Overall, it’s a nice piece, the base is numbered and the publication will come out every fortnight. I do have only one reservation and that is how long will the series run? In the Marvel figurines, of which there were around fifty, I could name each one that I bought, the trouble is, could I name even half as many characters from Game of Thrones that I would be interested in collecting?